The mural in our conference room is 25 feet long and 5 feet 10 inches high, and was painted with oil colors on canvas in Florida. 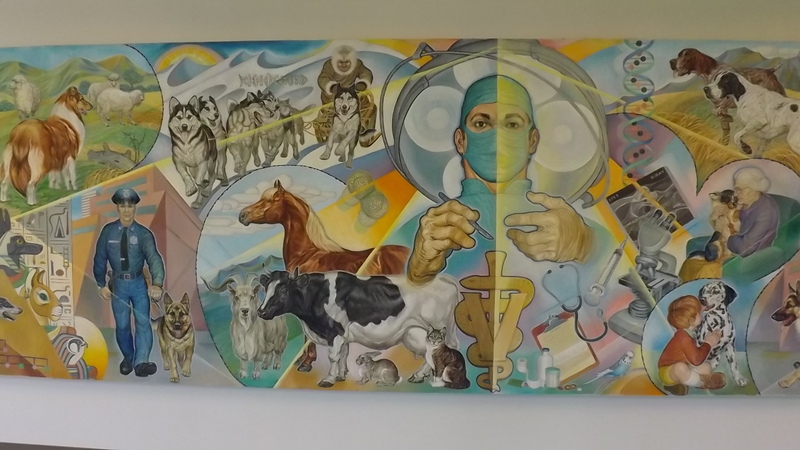 It was then flown to Connecticut and mounted on the plaster wall specially designed for the mural when New Haven Central Hospital for Veterinary Medicine was built in 1974. 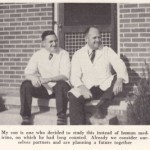 The artist, Ernest Hart, is the father of one of our founding veterinarians, Allan Hart. The mural has become an iconic image for the hospital. For a period of time, the New Haven Historical Society featured the mural in small exhibit as an iconic New Haven image. 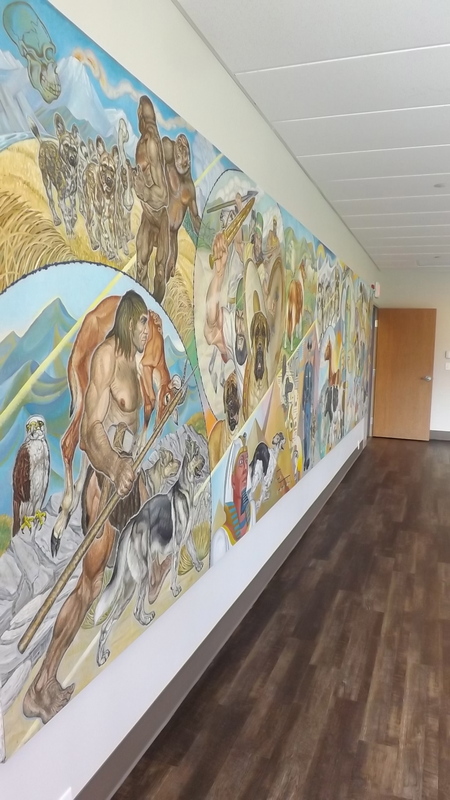 We are proud of our mural and we brought it with us to our new location in North Haven where it occupies the main wall of the conference room. The story depicted in this wall painting is the association of man and dog throughout the ages. Two widely separated species, they have depended on each other for sustenance, aid, and that spiritual linkage we term companionship since an archaic era buried deeply in the womb of prehistoric time. The mural begins in the upper left hand with a scene that could have occurred two million or more years ago on our planet Earth. We see a pair of very early hominids, Australopithecus Africanus, caught on the open savannah and being pursued by a slavering band of early transitional canines similar to the wild, harlequin Cape Town Hunting dogs of contemporary Africa. The Australopithecines were small but sturdy ape-human creatures, weaponless and easy prey for the wild dog packs that had reached species stabilization long before the first man-like creature left the trees to stand erect upon the earth its species was destined to dominate. Hundreds of thousands of years moved slowly into oblivion as mankind evolved from the hunted to the hunter. When human association gained greater stability in the Mesolithic Age, the dog, which scavenged on the outskirts of Paleolithic encampments, found acceptance as a hunting partner, a guardian of the hearth, a companion and a beats of burden as man followed the herbivorous animals. In the lower left corner we see an ancient hunter and his dogs after a successful search for living food. This unique unity between two very different species brought significance to the New Stone Age and marked the beginning of the “Neolithic Revolution” which saw the domestication by men of plants and animals. About 2700 B.C., on the banks of the turbid Nile, Egypt, in the Third Dynasty, reached fruition as the cradle of civilization. Animals of many kinds were woven into the rich fabric of Egyptian religion and philosophy: the dog, the snake, the cat goddess Bast, Horus the hawk goddess are but a few. The nobility developed several breeds of canines, and the Saluki, seen in the mural’s Egyptian section, is an example of the ancient sight-hounds the Pharaohs bred for the chase. The ages passed and advancing civilization taught man greed, corruption and the brutal art of war. The eighth century B.C. witnessed the savage grandeur of the Assyrian empire reach its zenith as its conquering armies swept over the known world, utilizing their battle plans and advance guard of ferocious mastiffs to break the formations and courage of their adversaries. In the progressing process of human evolution the hunter eventually became the herder as man realized that he could contain the herbivorous meat creatures within a limited area through domestication rather than pursuing a transhumance existence following the wild herds. The pastoral age came into being and again the dog filled an important niche as a herder and protector of the herds and flocks. 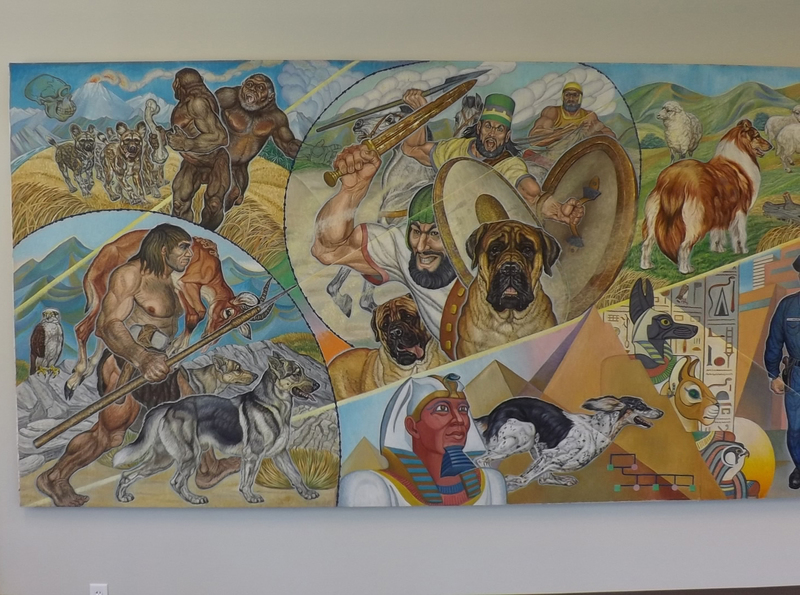 A collie stands guard over his flock in the mural representing the herding breeds, a chore to which many breeds of canines throughout the world are still dedicated. The sled dogs of the frigid north have made exploration of that white wasteland possible, and have brought life-saving serums and food to icebound settlements. The Eskimo, a modern Mesolithic man, depends upon his dogs for mobility, as an aid in the hunt, and to help him sustain his very life in a forbidding environment. So over the myriad of centuries since the time when man reached human status, the dog has served him. The present finds our canines in many variations of their early roles while adding to their repertoire with new tasks. We find here a canine law-dog with his patrolman companion, and we see the dog in one of his most appealing roles as a guide for the blind, providing new independence and dignity for the sightless. Pictured are the dog as a child’s friend and protector, and as the companion and confidence of the lonely aged. At the top extreme right, is a modern hunter indulging in a day of healthful sport with his fine pointers, and behind him, recognizing kinship, stands the ghost of all the archaic hunters of the past. 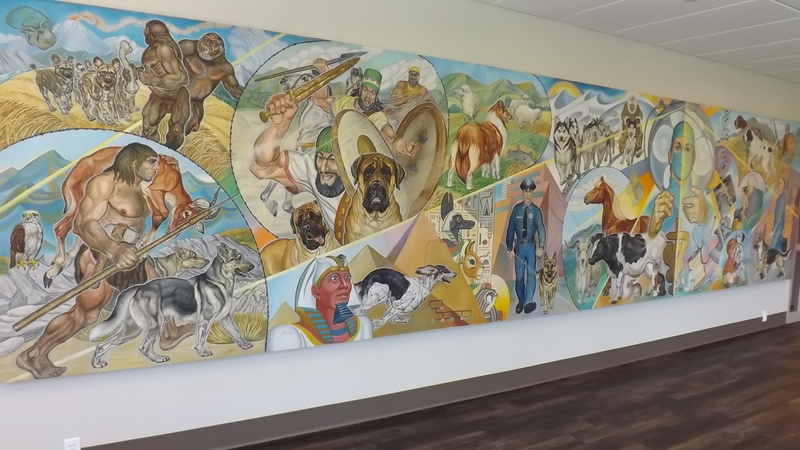 The focus of the entire mural is the large figure of the veterinarian surrounded by some of the instruments of his dedicated occupation and a representative group of the creatures, other than canine, which he treats and cares for. 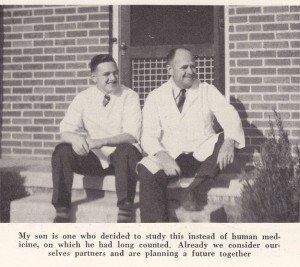 Here is the epitome of the coalition of man and dog as the veterinarian utilizes all the elements of modern scientific medicine for the health and welfare of our canine friends. Symbolic units are utilized in a decorative pattern throughout the mural to become a pertinent part of the design: the skull of Neanderthal man, the pedigree device, and diagrammatic symbols of matched chromosomes, mitosis (cell separation), the DNA spiral, the genetic symbols for male and female, and a fertile canine egg. Cast shadows that would freeze the figures in a specific time sphere have not yet been employed. Pictorial chiaroscuro is instead achieved through the visual advancing and retreating properties of pure color pigment. The same in-depth color characteristics have been utilized to bring overall balance to the mural. Compositional lines form a pictorial script, an animated arabesque that joins volumes and shapes to present a coherent stylistic pattern. The mural tells a visual story and it was therefore necessary to use a traditional and academic approach, but to hold the entire composition together the artist has indulged in an abstract and compositional design. From the climatic figure of the veterinarian there radiates fingers of light and line that touch each area of the painting binding the component parts and the theme to each other and to the dominating shape of the veterinarian. About the Artist – Ernest H. Hart was internationally known as an illustrator, painter of animals, and an abstract impressionist. He has exhibited in some of the finest galleries in North and South America. He also authored and illustrated sixteen prestigious books in the animal literary field. Under sponsorship of the Fédération Cynologique Internationale he was a popular dog judge of breeds throughout the world.